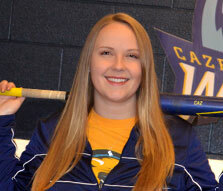 A Passion for Softball Led to Cazenovia College and Then to South Africa. When college mail began to arrive at Laura Matekovic’s home, she kept a look out for institutions that offered sport management programs. She decided to visit Cazenovia College because of the sport management program; however, her interest was truly piqued by the Division III softball team. While a major in sport management was initially Matekovic’s interest, she switched to business management after her freshman year at Cazenovia. Her decision was influenced by a summer internship with WSFS bank in suburban Philadelphia. It occurred to her while working there that a degree in business management would help to broaden her range of work opportunities. While in the long term Matekovic wants to have her own photography business, she plans to start her career working for an established business. In addition, minoring in entrepreneurship has allowed her to meet with business owners in Cazenovia through an internship with the Greater Cazenovia Chamber of Commerce. For business management majors, the faculty are focused on teaching the importance of professionalism. They prepare students on how to dress, how to act and speak, how to write emails, and how to address issues. “It is the little things that people who are going to be in the formal workplace should know how to do,” imparts Matekovic. Matekovic has found the business management program so rewarding at the College that she is considering the 4 + 1 program at Le Moyne College, in order to get her MBA. The one-year graduate program includes a study abroad opportunity for one week in Beijing, China, where three credit hours are earned. Cazenovia College students are also offered a discount per credit hour. The study-abroad program in Canterbury, England, has been one of Matekovic’s most favorite experiences while attending Cazenovia College. Two core classes for the students were Sites and Sights and Divided by a Common Language. For Sites and Sights, the class went on a field trip every Friday to a landmark like Stonehenge. Divided by a Common Language examined not only the disparities between English and American English, but also cultural and political differences. Another international opportunity—traveling to South Africa—became available to Matekovic during her time at Cazenovia. She was nominated and selected to participate in Beyond Sports, a global organization that promotes the role sport can play in creating sustainable social change, along with women selected from colleges and universities across the United States. “I didn't know a single person when I flew into Cape Town. After orientation, I met my roommate, Sam, who was from Long Island, and we became really close,” shares Matekovic. Another athletic clinic was held near Wilderness. This area was very impoverished, and the children participating in the clinic did not have the proper clothing to participate, let alone sports equipment. “There was a lot of scattered trash and kids running around with cuts on their feet. It was also very cold and raining,” says Matekovic.